Analysts are worried the third arm of government will become redundant if violent disruptions continue. The culture of violence evidenced recently during community and student protests appears to be entrenching itself in parliament too. 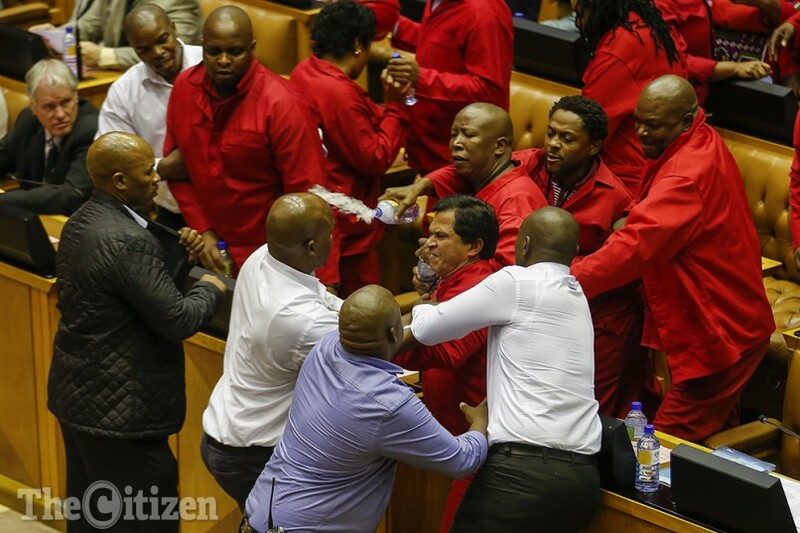 This was the view of political analyst Andre Duvenhage in reference to Tuesday’s battle that resulted in the forceful ejection of EFF MPs and damage to parliamentary buildings. “The implication of the fights in parliament are far-reaching,” Duvenhage said. Duvenhage said the lack of credible politicians presented a problem to parliament – and the country at large. “What we need now are statesmen. But that is not coming forth because politicians are fighting for their own private good and not the good of society,” Duvenhage said. Duvenhage yesterday told The Citizen that President Jacob Zuma could not be considered a strong and legitimate leader. “Processes related to Zuma, the general socioeconomic conditions and the upcoming local government elections are producing an uncertain violent environment,” he said. While some were calling for security to be tightened, EFF leader Julius Malema was involved in a brutal political battle. Meanwhile, Johan Burger, the senior researcher at the Institute of Security Studies, said the ongoing violence in the country was a concern. “If you engage in violence in parliament, how do you expect the ordinary man on the street to listen to you when you say, ‘yes you can protest, but do it in a peaceful manner’?” Burger said. He went on to address Malema’s recent comments about removing the ANC government through the barrel of a gun. “If Malema vows to use violence as a method of politicking, then we are moving towards a dangerous confrontation,” Burger said. “If the chaos in parliament is allowed to continue, then the House will soon become redundant. Then we’ll be in trouble. Burger said the time had come for the clergy to step in. “Churches have been very quiet, and I think they need to intervene. Equally important, South Africans need to have serious discussions with one another regarding the current state of affairs,” Duvenhage said.